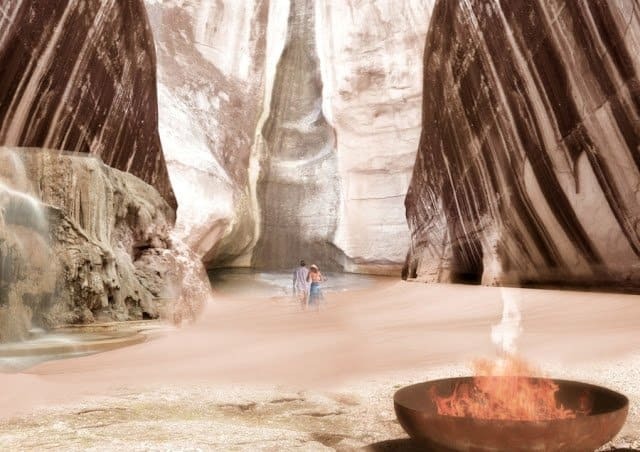 Just over two hundred years ago, explorer Johann Ludwig Burckhardt rediscovered the sandstone city of Petra in Jordan. 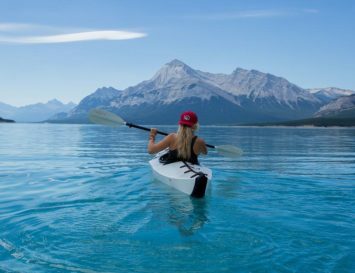 One of the architectural wonders of the world, the stone city has then since inspired countless stories, films, and architects, such as Florida based Chad Oppenheim. 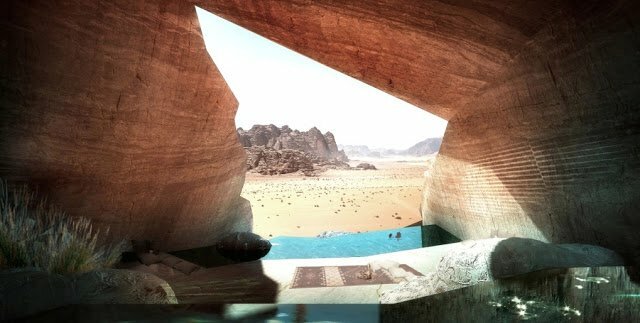 The American architect’s company, Oppenheim Architecture + Design, was commissioned to design an 80, 000 square foot resort carved out of rock in Wadi Rum. 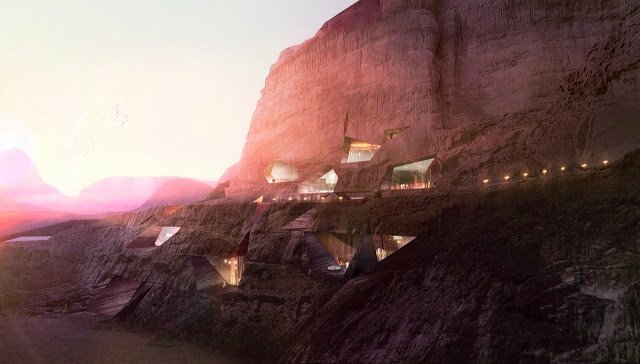 The resort, which is scheduled to open in 2014, will feature minimalist rooms with stunning views over gaping canyons, water holes and sand dunes. 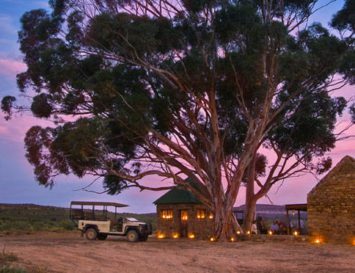 Like the majority of Oppenheim’s projects, this one will merge gently into its natural setting, using and enhancing the natural beauty of the desert to construct a hotel that is at once in tune with the environment and lavishly luxurious. Oppenheim ensured that mainly local materials would be used, and that strict water conservation measures would be taken, including harvesting rain water in underground cisterns and recycled grey and black water, which will be cleansed through a living machine powered on botanical and biological forces. 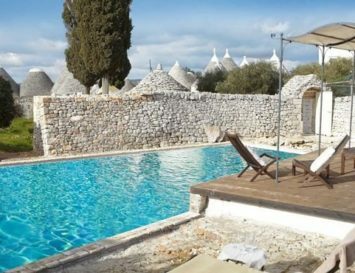 Traditional methods of using passive forms of cross ventilation and the naturally cooling properties of rock will help maintain a pleasant temperature of the resort, and will also minimise energy consumption and the resort’s carbon footprint. 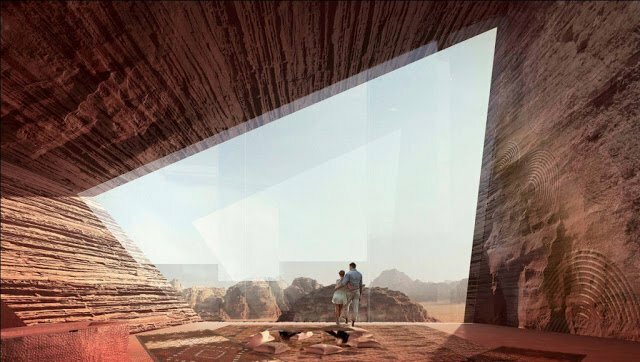 The 47 lodges that comprise the resort will be carved directly into the sandstone rock face and the key construction components will be comprised of local materials: namely, rammed earth and cement mixed with local red sand. 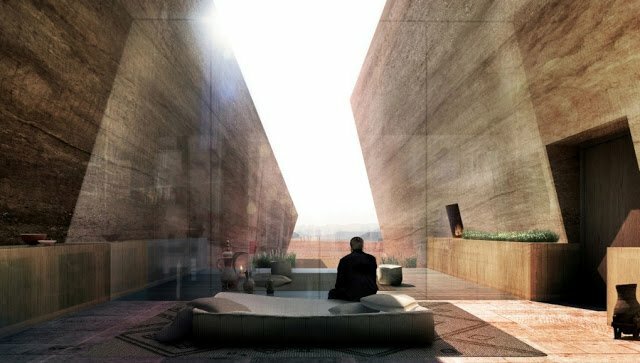 A luxury spa, featuring traditional local and international treatments, is also planned for the five star hotel. 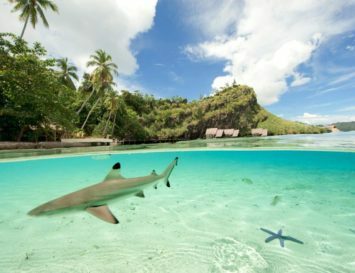 Jordan, which is one of the most stable countries in the Middle East, has lately become a tourist hotspot, not only for its rich and ancient history, but for the luxurious qualities of its spas and resorts, as well as the myriad eco-friendly activities on offer, which range from snorkelling and diving around coral reefs, hiking, swimming, rock climbing and biking. 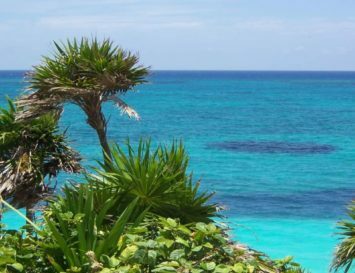 The royal family of Jordan has made the environment a priority in newly constructed resorts, and Queen Rania of Jordan is an outspoken advocate of renewable energy. 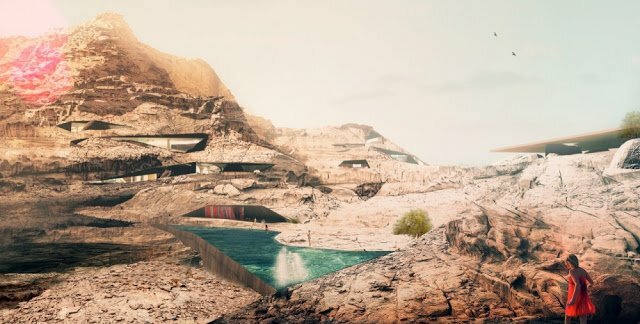 We’re hoping to be amongst the first visitors to Wadi Resort when it opens next year, but if you can’t wait to explore the natural wonders of Jordan, please click here.